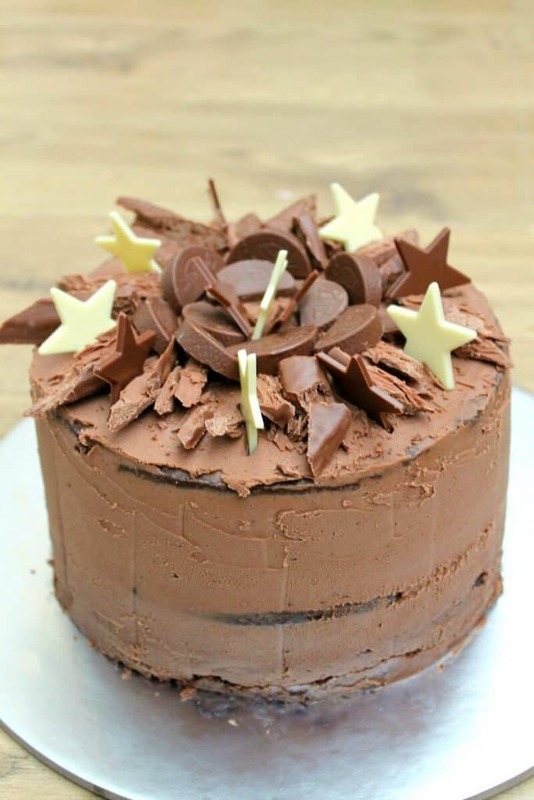 A delicious chocolate sponge cake with chocolate buttercream icing and decorated with even more chocolate, it will be ideal for chocolate lovers or just those who like an impressive cake. I made this cake for my daughter’s birthday as it was perfect to feed a horde of hungry kids after a hectic birthday party! On the top I went overboard with layers of chopped Flakes, segments of chocolate orange and milk and white chocolate stars. 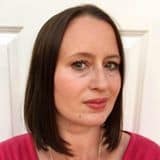 It is easy to get all of those ingredients from the supermarket with your weekly shop. The chocolate cake is rich and fudgy. 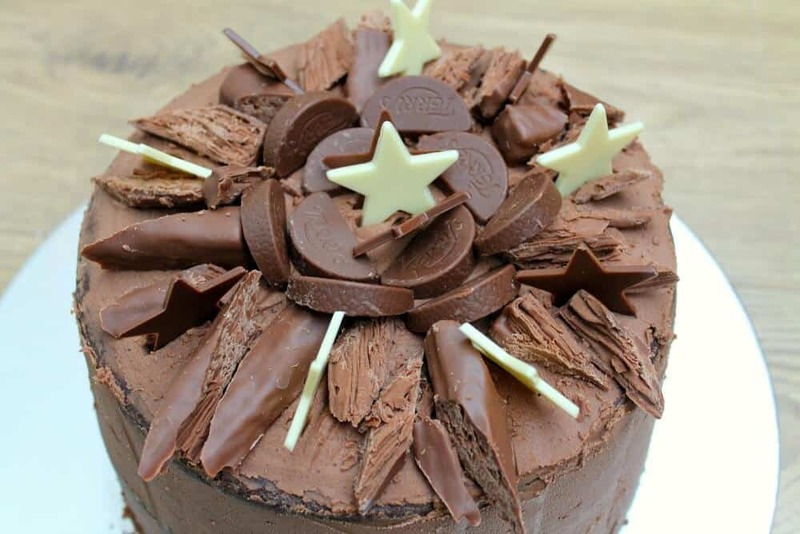 What Equipment Do I Need To Make This Chocolate Birthday Cake? Inside you have four layers of chocolate sponge cake. If your oven is big enough and you have four cake tins you can bake them all at the same time. If you only have two pans, you can use the same cake pans twice, which is what I do. How Many People Does This Birthday Cake Serve? This served a party full of children – around twenty – with plenty left for the adults too! If cutting small portions I would say it would serve 30, or 20 for larger portions. It is very rich so a smaller portion is fine. How Else Could I Decorate This Cake? You could leave out the chocolate on top and replace it with some fruit, sprinkles, macarons or whatever you like. 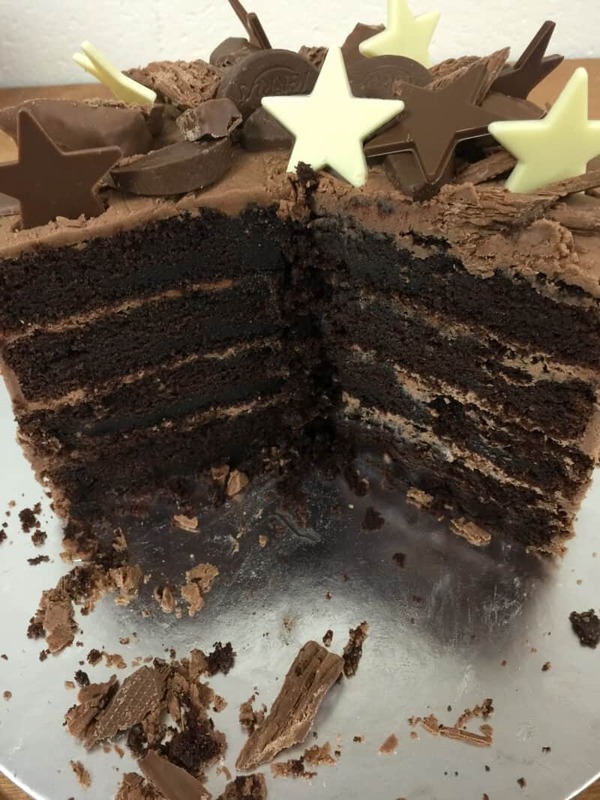 You could halve the amount of buttercream and use it only in-between the layers and on top. Can I Make This Cake in a Slow Cooker? 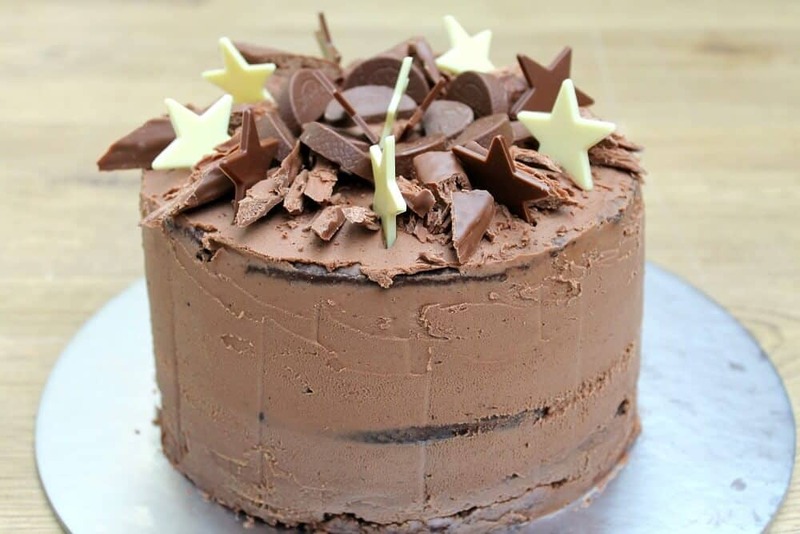 This chocolate cake is too much mixture to make in a slow cooker. 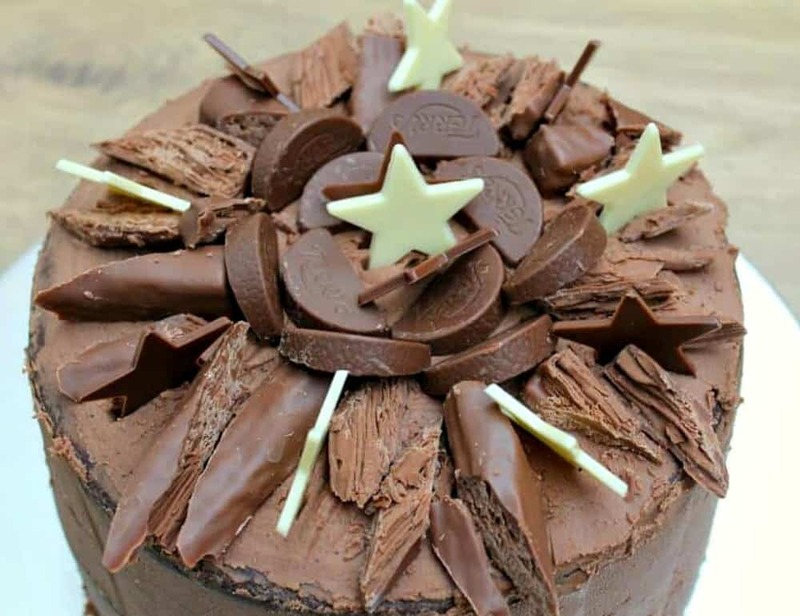 I’d recommend this slow cooker chocolate cake instead, which is smaller, but you could still decorate the top in the same way for a similar effect. Omit the Creme Eggs and it is a still great basic cake recipe. 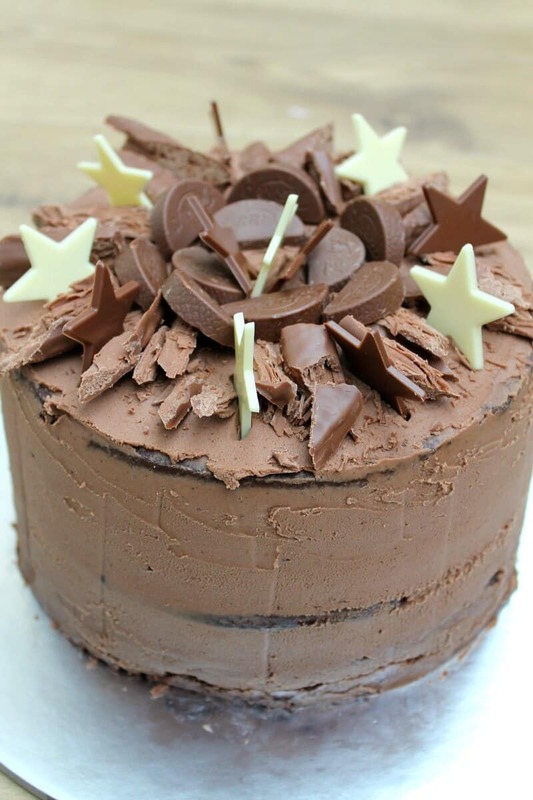 Pin this chocolate birthday cake for later! Preheat the oven to 180°C/350°F/Gas Mark 4. Lightly grease two 7 inch cake tins. If using 2 cake tins, you will leave half the mixture until the first two cakes have baked. If using 4 cake tins, prepare them all now. In a jug, add the boiling water and cocoa powder, mix until smooth, then leave to cool. In a large bowl, sieve the flour and add the baking powder, baking soda and salt. Leave this until needed. In a stand mixer, cream together the butter and sugar until light and fluffy. Add the vanilla extract and then the eggs one by one. Beat well after you add each egg. Add all of the flour, and mix gently until combined. Fold in the cooled cocoa powder and water mixture. Divide the mixture into the prepared cake tins. 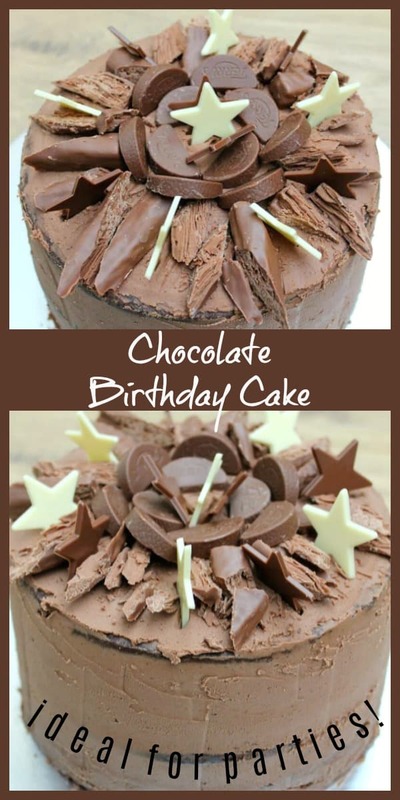 If you are using two cake tins and will bake in two sessions, put half the mixture aside. Bake for 35 minutes, or until a cake tester (or knife or skewer) comes out clean from the centre of the cake. Leave to cool in the tins until cool enough to touch then turn the cakes out onto a cooling rack. Now, if you used two tins, wash and regrease them and bake again with the rest of the mixture. Note that you will have some excess buttercream icing from this recipe. It can be kept in the fridge for 3-4 days or frozen in a tub for another time. Make sure your butter is very soft. Cut the butter into cubes and put it in the stand mixer bowl. Beat until the butter very soft and fluffy. It should also be lighter in colour than when you started. Add the icing sugar little by little to avoid icing sugar clouds and start of mixing on low. Once incorporated turn the speed up and mix well. Continue adding the icing sugar little by little until it is all added. Add the milk a tablespoon at a time, checking the consistency. Adding the milk will make the icing a little softer and more spreadable, so make sure it is as you'd like it to be and adjust the milk as needed to get your ideal result. Put the first cake layer (completely cooled) on your cake turntable. Cover the top with a thick layer of icing, then add the rest of the cake layers in turn and do the same. Once all four are stacked, using a palette knife and apply the icing to the sides of the cake and spin the turntable round, smoothing the icing on with the knife, to make a smooth thick layer. Carry on until the sides of the cake are all covered. Now use the palette knife to put icing on top of the cake and smooth again, turning the turntable around until smooth and even. Chop the Flake bars up as desired and decorate the top of the cake with the chocolate as you prefer. Recipe for the cake adapted from this triple-layer chocolate cake recipe on Good To Know.